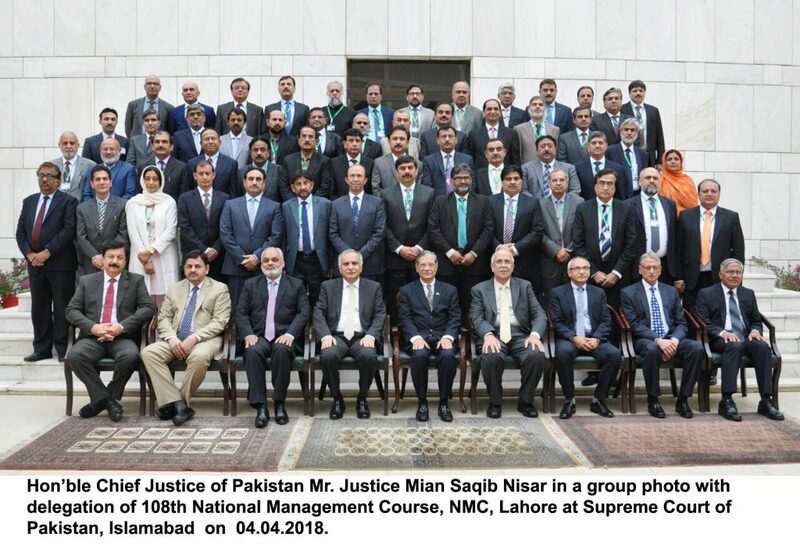 ISLAMABAD:(APS) April 4, 2018-A 60 member delegation comprising 8 faculty member and 52 course participants of 108th National Management Course, National Management College, Lahore called on Hon’ble Chief Justice of Pakistan Mr. Justice Mian Saqib Nisar in Supreme Court Islamabad Wednesday on 04.04.2017 as a part of their inland study tour. Chief Justice of Pakistan Mr. Justice Mian Saqib Nisar welcomed the delegation and gave them an overview of the Constitution of 1973 of Islamic Republic of Pakistan. His lordship dilated upon the role, function and importance of each limb of the State and emphasized that the bureaucracy, being an implementing organ of the State, must gain adequate knowledge of administrative laws to dispense their duties independently, honesty and transparently in accordance with the law and the Constitution. They must strive to gain full knowledge of the guidelines set by superior courts on administrative issues in their case laws to serve the purpose of justice. The Chief Justice of Pakistan also briefed them on the judicial system, its functioning, role, dispensation of justice and constitutional jurisdiction of Supreme Court to provide relief to the people. He also explained that Supreme Court under constitutional scheme possesses special jurisdiction of the judicial review to examine certain acts of legislative and executive organs of the State on criterion of the Constitution. Furthermore, Hon’ble Chief Justice told them about the fundamental rights enunciated in the Constitution and emphasized the need of enforcement of fundamental rights. He also cited many famous judgments of Supreme Court on enforcement of fundamental rights. He expected the same from them being the part of the senior bureaucracy of the country to respect and enforce fundamental rights of the people and added that without good executive, good governance is not possible. Later, he answered the questions of the participants in an interactive session and shared his experiences.